An exciting new suite of ukiyo-e woodblock prints and netsuke have recently been installed in the "Japan" section of the World View exhibition, which is now on display in the ground floor galleries of the Dunedin Public Art Gallery. This re-hang presents a new view into the gallery’s significant Japanese holdings, many of which have been bequeathed to the collection at various points throughout its history. In Edo-period Japan (1615-1868), ukiyo-e prints focused predominantly on the transitory nature of everyday life in the Yoshiwara district (the licensed pleasure quarter and social hub of Edo), depicting seductive courtesans, kabuki actors and activities within the landscape. Ando Hiroshige (1797-1858) was one of the two prominent ukiyo-e artists, along with Katsushika Hokusai (1760-1849), who explored and celebrated the landscape — both urban environments and rural scenes. It was a focus which saw the landscape genre rise to popularity among both artists and collectors. Included in this re-hang are eight of the 53 woodblock prints from Hiroshige’s famous and ground-breaking series The Fifty-Three Stations of the Tokaido Road (Tokaido gojusan tsugi no uchi), published by Hoeido. 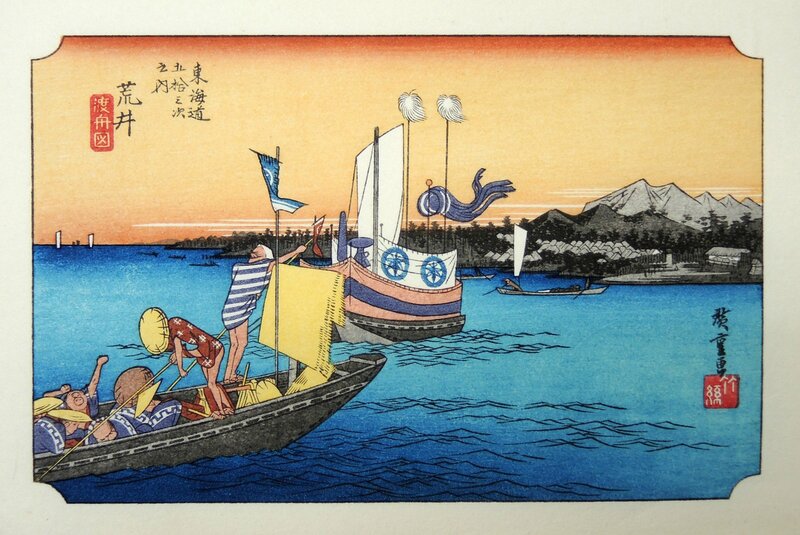 The Tokaido Road was the main highway that followed the coast and connected the imperial capital of Kyoto with the modern centre of Edo (now Tokyo). In 1832, Hiroshige was invited to join an official procession that travelled along the Tokaido, allowing him to experience the journey first hand. These small-scale travel prints depict the various stations, or resting areas, and activities that were taking place on this journey, presented to us with Hiroshige’s characteristic colour palette, beauty, drama and atmosphere. Lauren Gutsell is curator at the Dunedin Public Art Gallery.